Duet for Theremin & Lap Steel in Times Free Press – Barking Legs Theater • Chattanooga, Tenn. Thanks to the Times Free Press for featuring our Saturday show in this week’s Chattanooga Now! Follow this link, or read on below, but above all else COME TO THE SHOW! Duet for Theremin and Lap Steel, featuring the music of Scott Burland and Frank Schultz, will return to town for a show at Barking Legs Theater, 1307 Dodds Ave., on Saturday, Aug. 4. 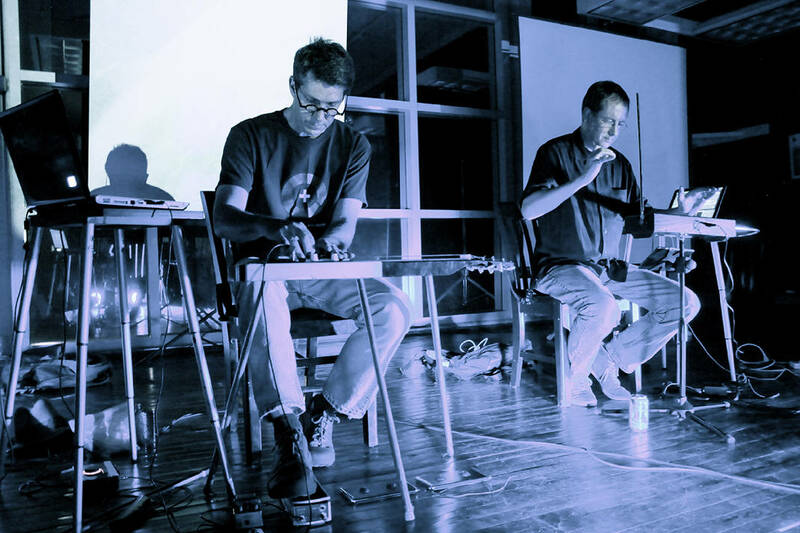 Duet for Theremin and Lap Steel creates a combination of sounds from two nonfixed-pitch instruments and laptops in an improv environment. Burland (Theremin) and Schultz (lap steel) don’t perform scripted works, but improvise tones that develop and transform gracefully. Over their 12-year existence, they’ve toured extensively in the United States and Europe, released four CDs and have played the Big Ears Festival in Knoxville, EtherFest, the Electro-Music Festival, WhoFest, City Skies Festival and the Improvisor Festival. The show will offer a multimedia performance, with a variety of sensory exploration. Duet for Theremin and Lap Steel will be accompanied by dancers Ann Law and Beth Markham Herring, a new work by Atlanta filmmaker Robbie Land and improvisational guitar by Todd Rush. Highlights from the 30-year-old Shaking Ray Levi Society/WUTC radio show “Outside Pleasures” archives will be introduced by storyteller Tom Landis, and there will be a Theremin demonstration/question-and-answer session. The entire theater will be utilized, with “Outside Pleasures” taking place in the lounge at 7 p.m., and the music/film/dance following at 8 p.m. in the theater. The evening is co-produced with the Shaking Ray Levi Society.